This particular memory is housed in one of the deepest, warmest parts of my heart. In my mind, the entire experience is encased in a rosy, golden hue, and not because I’d just had a highly medicated labor. No, this memory boasts a rosy glow all it’s own. I remember the sunlight streaming in from the hospital window, the smile on her face. I’m sure there was some noise in the hallway. I know that my abdomen was aching with the fresh wound of my C-section. I think a tray of lunch and maybe even a dirty diaper cluttered the hospital bed and crumpled blankets lay around my legs. But those images are all muted in my memory. Everything stopped the moment that she said those words. She was going to have a baby. The baby we’d prayed for. The baby we’d cried over. The baby we had waited and waited to meet. That baby was coming. I so wanted to reach out my hand and grab hers; I wanted to jump up and give her a hug, but I knew neither of those sudden movements would fair well on my body, so I just sat there looking at her, smiling awkwardly but overcome with joy: my brand-new baby daughter snuggled in the arms of my sweet friend, Corinne, who would soon have her own new baby. Honestly, I had been worried about my friend visiting me in the hospital. She had spent two years trying to conceive her second child. After months of negative tests and two miscarriages, she worried—we all worried—that perhaps she would never conceive again. To add to the pain and complexity of it all, my third baby arrived unexpectedly. A surprise pregnancy that shocked us with, frankly, quite a bit of stress. When I discovered I was pregnant, my older children were two years old and ten months old. I hadn’t even had time to think about a third baby, but she was on her way whether we liked it or not. The birth of my daughter is always going to be significant—she’s my daughter—but her birth also coincides with another incredible joy: the joy of my friend. We always talk about how it takes a village to raise a child. Baby showers and meal calendars are commonplace topics of pre-baby conversations. The people who love us gather round to help prepare for the new life. Before I became a mother, and then in my six and a half years since joining the ranks of motherhood, I’ve been acutely aware of the benefits of having a village around me. When our oldest was placed with us, I only had a baby crib and one blanket. My husband and I thought we would have to wait longer for a baby, and since we were adopting through the foster system we didn’t know how old our placement would be. It was hard to adequately anticipate our needs, so we were fully unprepared. While we were signing papers and finishing up the required foster parent training courses, my girlfriends planned a baby shower for us and, to tide us over, my friend Megan brought over a giant bag of brand-new clothes. She popped by on the day we brought our son home, snapped our first photo as a family of three, and snuggled our new little boy while I waded through a pile of adorable clothes: sweatpants, onesies, sleepers. She had fully outfitted him. One of my favorite items from Megan was a grey Henley onesie with navy blue trim and navy blue buttons. My son wore it only a few times before his chunky legs and barrel chest threatened to burst the seams, so I washed the onesie carefully, folded it, and placed it—along with the other too-small clothes—into a box and saved it. Two years later, my friend Caitlin had a baby boy, and I passed the box of my son’s hand-me-downs on to her. Well, one year later another one of my girlfriends had a baby boy. Caitlin passed the clothes along to our friend Leah and her new baby. These onesies were surprisingly durable, for the most part. We’d lost a couple to blowouts and spit-up, but that grey Henley was holding strong. Recently Meg sent out a text message with a picture of her son in the grey Henley. Some of the clothes Megan had bought for me nearly five years ago had come full circle. Now it’s more than just a faded grey onesie with three blue buttons; it’s a love letter from all of us, the mothers who have the privilege of loving him. It’s a visual reminder of the continued blessing of friendship and the ways we’ve supported and cared for each of our babies over the years. Because we haven’t just passed a onesie around, Sisterhood of the Traveling Pants style. The clothes are just one thread in the larger fabric of our relationship. Between pregnancies, childbirths, baby showers, and birthday parties, we do the hard work of mothering side-by-side. We’ve lamented potty training woes and shared tips on how to discipline a sassy threenager. 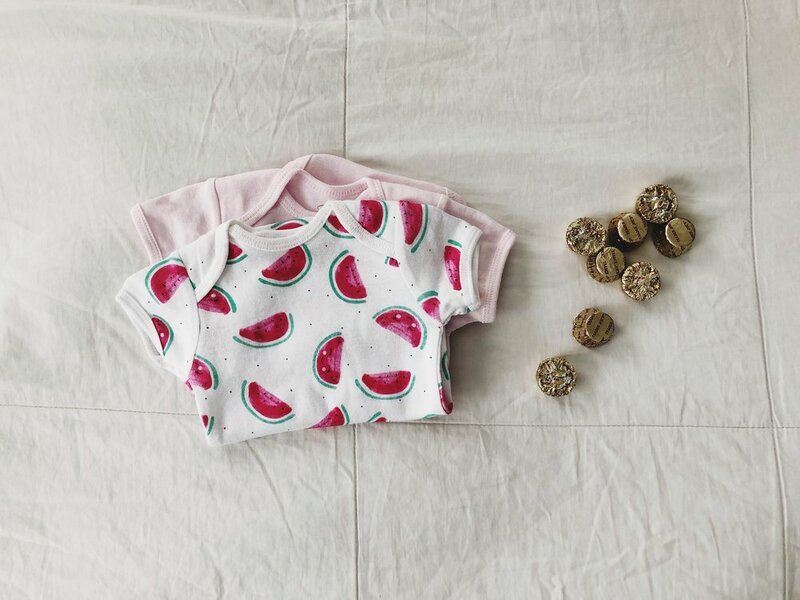 We’ve shared our Pack N’ Plays and baby bassinets along with mastitis-prevention tips and recipes for lactation cookies. Because of my bonds of friendship, my children have a rich extended family of close friends. My children love and fight with these friends like siblings, and as a result, we’re all unpacking a deeper understanding of forgiveness and conflict resolution. Before motherhood, I had no idea how dear the babies of my friends would be to me, and I didn’t realize I would feel the growth and development of my girlfriend’s children so deeply. It turns out, one of the most wonderful joys of motherhood is the other mothers. Last week Megan passed along that Henley to Corinne. She gave birth to a beautiful baby boy, and I can’t wait to watch him grow—to be part of his village. A version of this essay originally appears in The Magic of Motherhood. Almost every week, I show up at a friend’s house with a car seat slung over my elbow and two toddlers in tow. We let ourselves in the back mudroom door, and I try to remember to take my kids’ shoes off—although more often than not, I never bothered to put shoes on their feet in the first place. My twins make their way into the kitchen and I set the car seat in the corner, praying the baby stays asleep a little longer. My son climbs behind the armchair in the playroom to retrieve the box of trains, and my daughter heads to the white, child-sized table to color. There are four of us that get together nearly every week, twelve kids between us all. A handful of the kids are at school during the day, so only having eight or nine kids around feels almost calm. Once the chaos and noise level come to a head, we gather the tiny humans together for a snack. Maybe that’ll keep them busy enough for us to talk just a few more minutes. We divvy out veggie straws and raisins, crackers and fruit. It’s not uncommon for me to end up staying through lunchtime, in which case out comes the turkey, cheese, and bread. But I never bring the snacks. You’d think I would, with my obsession with food and love for cooking. I promise my intentions are good. Every Wednesday I tell myself to get something ready to bring on Thursday morning, and every Thursday morning I rush out the door with a few kids, a handful of diapers, and no snacks to share. I don’t like being the one who can’t contribute, the one who is fed but doesn’t feed—especially since I truly do love to cook and believe deeply in the value of sharing food. But as I walk further down this motherhood road, I’m learning more and more how deeply I need other mamas, how I can't—and shouldn’t—do this alone, and that sometimes just showing up is okay. So I walk in that back mudroom door with my hands full of children, and nothing else. That freedom is a precious gift. The days will come again when I’ll bring the snacks. I’ll pay it forward and love on other mamas the way I’ve been loved. But until then, I’m grateful for the grace to show up empty-handed. Add all the ingredients to a food processor. Pulse a few times to mix everything together, then continue to process until the mixture is crumbly. Everything should look relatively uniform in size, so if you have any large pieces of almonds, pulse a few more times to chop them up. Shape into balls, pressing the mixture firmly together so it sticks. Shaping them can get a little messy. I’ve found it helps to put a little coconut oil on my hands and work over a large bowl so extra crumbs fall into the bowl rather than all over my kitchen. Place on a baking sheet and freeze until firm (at least a half hour). Transfer to a zip-top bag or airtight container. Store in the fridge for a week or so, or keep them in the freezer for up to several months.